Sent to Christchurch City Council 20 sec later. 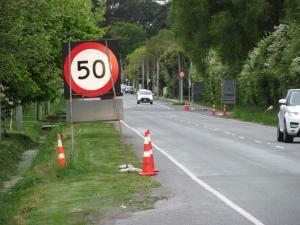 There is a 30kph Temporary Speed Limit in place for roadworks on Cashmere Rd at Penruddock Rise. Unfortunately, the gated derestriction signs for eastbound traffic uses 50kph signs, even though this is still within a permanent 60kph speed limit area (you can see the permanent 50kph sign about 300m further up the road, at the point 190m west of Kaiwara St where the speed limit legally changes from 60kph to 50kph (and from 50kph to 60kph in the other direction)). This leads to a situation where different speed limits apply in opposite directions on a two-way road, a recipe for disaster for turning motorists … Assuming CTOC hasn’t approved such a dangerous Temporary Speed Limit layout, might I suggest they get the TSL signs changed to 60kph (to match the legal speed limit)? The Police should also be notified, just in case they’ve incorrectly issued any speeding tickets (which probably would apply to the 30kph section as well …). Signs at end of TSL changed to 60kph ones.